You can find coins, rings, jewelry, gold, relics, small buried caches and even deep treasures without knowing scientifically how a metal detector works. But to give you a better understanding, we created this video and simple illustration to show you How a Metal Detector works. 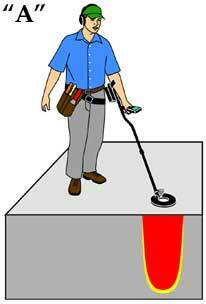 Illustration 'A' shows a typical metal detector user. He has followed the instructions supplied by the manufacturer and has his metal detector turned on. After testing his detector on some surface targets (coins) to make sure it is working, he now starts searching for buried coins and treasures. Notice the "red" signal pattern being transmitted from the search coil into the ground. (Note: we have enlarged the illustration of the signal pattern for easier understanding). As long as the signal entering the ground does NOT come in contact with metal, there will be no audio signal, no flashing light, no vibration, nothing will happen. Illustration 'B' shows what happens when the detector user's metal detector search pattern comes in contact with metal objects, in this case both shallow and deep coins. When the search pattern touches metal it interrupts the transmitted signal and this interruption or disturbance of the search pattern will cause the metal detector to alert the detector user (you) with an audio signal, usually a distinct loud sound. In some cases flashing or blinking lights will accompany the audio signal. How Deep Will My Metal Detector Go? What Treasures Could My Detector Find? Can my Detector Work on Salt Water Beaches? Can I Eliminate Junk Targets? Are Different Size Search coils Necessary? 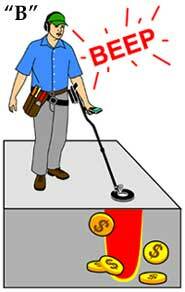 Call Toll FREE 1-888-KELLYCO for an easy to understand answer from one of our Metal Detector Experts. It is not necessary to understand the scientific principles of metal detection to use a detector. You can find coins, rings, jewelry, gold nuggets, caches or whatever you are searching for without knowing how your detector works. For better comprehension of that your detector is doing, however…to recognize why it just made that peculiar sound…to understand why it reacts the way it does to metals and minerals…it is necessary to learn how to a metal detector works. Two examples illustrate this need. First, let’s say you are scanning in the field and get a detector signal. You dig down a foot and find nothing. You enlarge the hole and dig another foot and still don’t find anything. You might keep on digging to five or six feet before finally giving up. Yet, your signal persisted throughout all this digging! What went wrong? Was it your fault, or that of your detector? Was a target there? Well, yes there was a target though it may not necessarily have been a metal one. The response could have been due to some variation in mineral content. For the second example, let’s say you are researching for a small kettle made of iron that is filled with gold coins. You know this iron kettle was left somewhere in a particular field under a large flat rock that had been placed on top of it. Unfortunately, however, there are at least one thousand large, heavy flat rocks lying in that field. The ground itself is highly mineralized and some of the large rocks themselves also contain a great amount of iron mineralization In these situations, knowing how your detector works, plus having an understanding of the various detectable minerals, will save you a great deal of effort. In the first instance, you will not dig at all, or perhaps no deeper than one foot, before you realize there is no metallic target in the ground. Unless you know something about iron minerals and their effect on metal detections, you will likely never find that iron kettle unless you decide to dig beneath every rock in that field. The “answers” to both these situation are presented elsewhere in this book. Modern Metal Detectors, seeks to present theory explanations that are simple with only very basic detector operating characteristics described. This book was intended not be a theoretical work but a home, field and classroom textbook to help metal detector users understand basic principles of their equipment. These principles are not difficult to understand. When you begin studying mineralization, target identification, field applications and other subjects, you will be rewarded by your study of this background material. You will understand what your detector is telling you…why you hear certain signals. You will become better able to determine if the object you have detected is one that you want to dig. Proper and highly efficient operation of a metal detector is not difficult. It does, however, require a certain amount of study, thought and field application. You have operated one-half of a metal detector during most of your lifetime, perhaps without knowing it…the common radio. Metal Detection is achieved, basically, by the transmission and “reception” of a radio wave signal. The block diagram on the facing page illustrates the basic components of a typical metal detector. The battery is the power supply. The transmitter electronic oscillator at the extreme left of the diagram generates a signal. The transmitter signal current travels from the transmitter oscillator through a wire (search coil cable), to the search coil’s transmitter winding (antenna), and the transmitter antenna is a few turns of electrical wire, generally wound in a circular fashion. This electronic block diagram of a transmitter-receiver metal detector illustrates the basic components of a metal detector as they are pointed out in the description at left. Whenever metal comes within the detection pattern, electromagnetic field lines penetrate the metal’s surface. Tiny circulating currents called “eddy currents” are caused to flow on the metal surface as illustrated in the figure on the facing page. The power or motivating force that causes eddy currents to flow comes from the electromagnetic field itself. Resulting power loss by this field (the power used up in generating the eddy currents) is sensed by the detector’s circuits. Also, eddy currents generate a secondary electromagnetic field that, in some cases, flows out into the surrounding medium. The portion of the secondary field that intersects the receiver winding, causes a detection signal to occur in that winding. Thus, the detector alerts the operator that metal has been detected. As transmitter current from the antenna generates the electromagnetic field, detection patter (dotted lines) is the area within which Metal detection occurs. Mirror-image pattern atop coil is not used. The detection of non-conductive iron (ferrous) minerals takes place in a different manner. When iron mineral comes near and within the detection pattern, the electromagnetic field lines are redistributed, as shown in the figure on the following page. This redistribution upsets the “balance” of the transmitter and receiver windings in the search coil, resulting in power being induced into the receiver winding. When this induced power is sensed by the detector circuits, the detector alerts its operator to the presence of the iron mineral. Iron mineral detection is a major problem for both manufacturers and users of metal detectors. Of course, the detector of iron mineral is welcomed by a gold hunter who is looking for black magnetic sand which can often signal the presence of placer metal. On the other hand, the treasure hunter, who is looking for coins, jewelry, relics, gold nuggets, etc., usually finds iron mineral detection a nuisance. When any metal comes within the detection pattern of a search coil, eddy currents flow over its surface, resulting in a loss of power in the electromagnetic field, which the detector’s circuits can sense. When a target comes within the detection pattern, search coils windings become imbalanced at Point A and B, and electromagnetic field lines are redistributed as shown in this drawing. Any substance penetrated by the electromagnetic field is “illuminated.” Many elements and different combinations of minerals are within the soil, including moisture, iron and other minerals, some detectable an some not. Of course, it is hoped that the targets being sought are also present. A detector’s response at any given moment is caused by conductive metals and minerals and ferrous non-conductive minerals illuminated by its electromagnetic field as shown in the drawing below. One detector design criterion requires the elimination of responses from undesirable elements, permitting signals only from desirable objects. How this discrimination is accomplished depends on the type of detector. This typical matrix beneath a metal detector’s search coil illustrates how the electromagnetic field generated by the antenna in that search coil illuminates every metal target in the area it reaches. "Coupling" describes the penetration of the electromagnetic field into any object near the transmitter antenna. There is perfect coupling into some objects such as wood, fresh water, air, glass, and certain non-mineralized earth materials as shown in the drawing below. Coupling is inhibited, however, when the electromagnetic field attempts to penetrate iron mineralization, wetted salt, and other substances. This inhibiting of the electromagnetic field, as shown in the drawing on the facing page decreases the detection capability of the metal detector. Even though modern instruments can eliminate the effects of iron minerals, the electromagnetic field is still inhibited (distorted), which results in reduced detection capability and performance. Salt water (wetted salt) has a disturbing effect upon the electromagnetic field because salt water is electrically conductive. In effect, salt ocean water “looks like” metal to some detectors! Fortunately manufacturers are able to design detectors capable of “ignoring” salt water. This diagram of "perfect coupling" illustrates the general shape of a detection pattern that occurs when the electromagnetic field from a search coil penetrates earth or any other nearby object. Numerous factors determine how deeply an object can be detected. The electromagnetic field generated by the search coil transmitter antenna, flows out into the surrounding matrix, generating eddy currents on the surface of conductive substances. Any detectable target that sufficiently disturbs the field, is detected. Three factors determine whether the disturbance is sufficient for detection: electromagnetic field strength, target size and surface area. How far does the electromagnetic field that flows out into the surrounding matrix extend? Theoretically to infinity…but you can be certain it is extremely weak when it gets there! In fact, only a few feet away from the search coil, the field is greatly reduced in strength. Several factors, including attenuation (absorption by the earth, matrix, materials, etc) and distance, reduce the field strength. When all things are considered, a detector may have several thousand times less detection capability at six feet then it does at one foot, so you can understand why detectors are limited in their depth detection capability. Detection depth capability is inhibited in some elements such as iron mineralization and wetted salt where coupling is inhibited when the electromagnetic field attempts penetration. Targets can be detected better and more deeply simply because of their size. Larger targets are easier to detect because they produce more eddy currents. One object with twice the surface area of another, will produce a detection signal twice that of the smaller object but it will not necessarily be detected twice as far. By the same reasoning, the larger target will produce the same amplitude detection signal at a distance farther away from the bottom of the search coil than the smaller target. Size is also an important factor in target discrimination, a metal detector characteristic discussed elsewhere in this book. Any detected object has its own pattern, as shown above, with the detection pattern for the jar of coins being wider at the top and extending farther away from the search coil’s bottom. Metal Detectors are, for the most part, surface area detectors. They are not metallic volume (mass) detectors. The larger the surface area of a metal target that is "looking at" the bottom of the search coil, the better that target will be detected. The actual volume or mass of the target has very little to do with the most forms of detection. Prove this for yourself. Turn your detector on and tune it to threshold. With your hand, bring a large coin in towards the search coil with the face of the coin “looking at” the bottom of the search coil. Make a note of the distance at which the coin is first detected…say, eight inches. Now, move the coin back and rotate it ninety degrees so that the edge of the coin “looks at” the bottom of the search coil. When you bring the coin in toward the search coil, you will see that the coin cannot be detected at eight inches. In fact, it probably will be detected only at a distance of four inches or less. Another proof of surface area detection is to measure at what distance a single coin can be detected. Then stack several coins on the backside of the test coin and check to see how far this stack of coins can be detected. You’ll find that the stack can be detected at only a slightly greater distance, illustrating that the increasing the volume of metal had very little effect on detection distance. Fringe area detection is a phenomenon of detection, the understanding of which will result in your being able to discover metal targets to the maximum depth capability of any instrument. The detection pattern for a coin may extend, say, one foot below the search coil. The detection pattern for a small jar of coins may extend, perhaps, two feet below the search coil as illustrated in the drawing on the facing page. Within the area of the detection pattern, an unmistakable detector signal is produced. This illustration shows the location and approximate proportional size of the fringe detection area in which faint target signals from around the outer edges of a normal detection pattern can be heard. What about outside the detection pattern? Does detection take place? Yes, but the signals are too weak to be discerned by the operator except in the fringe area around the outer edges of the detection pattern as shown in the drawing above. A good set of headphones is a must, if you desire to hear fringe area signals. The next more important thing, is training in the art of discerning the faint whispers of sound that occur in the fringe area. Skill in fringe area detection can be developed with practice, training, concentration and faith in your ability. Develop fringe area detection ability to a fine art and you are on your way to some great discoveries that many detector operators will miss. The ability to hear fringe area signals results in greatly improved metal detection efficiency and success.